The flashy 80's and 90's were all about getting your paws on the latest things - cars, shoes, electronic gear. Today however, we are more considerate with our spending, placing higher value on the quality of the things we buy, their impact on the environment, and how much use we truly get out of them. Our frivolous nature has given way to a more frugal approach to living and what better way to celebrate this than to make the pilgrimage on the great Garage Sale Trail. Now in its fifth year, the Garage Sale Trail is a nationwide garage sale to be held on Saturday, October 24th. Support from over 120 councils nationwide means that households, churches, schools, community groups, and charities can register for free, acquire a garage sale kit, and be a part of the trail map. With over 10,000 garage sales throughout major cities and rural areas, this indeed is an opportunity to clear out your clutter, or find a hidden gem for yourself. Listings on the Gumtree Sale Trail. If you're a seller, clear out the cupboards, the garage or your bookshelf for the ultimate spring-clean. Artisans can use this to sell handcrafted goods and artwork. Perhaps pool your resources with several other households for one big neighbourhood garage sale. 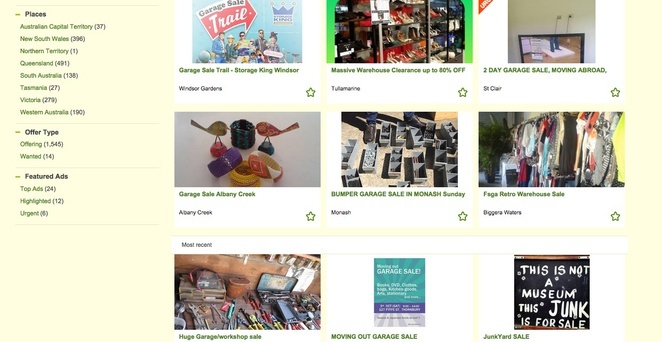 Get even more exposure by putting your garage sale on Gumtree. This is your chance to make a bit of money for yourself or your favourite charity in a sustainable way. Last year, the average seller made about $300 on the day and a dozen new friends in the community. Shoppers, search the interactive trail map and head out into your neighbourhood or farther afield to find a bargain and help the environment. This is the ultimate way to "reduce, reuse, and recycle". If you have children, garage sales are a great place to find little used toys and clothes for constantly growing kids. Collectors may find old stamps, records, or games to add to their collections and antique lovers could stumble across beautiful old jewellery or designer clothing. If you're just starting out on your own, preloved kitchen ware and household furniture will set your home up at a fraction of the cost of new sets. So, grab the kids, the in-laws, your friends, and head out on the Garage Sale Trail. Make the day an opportunity to buy or sell, connect with your local community and businesses, and maybe even find a little treasure along the way. Why? Clear clutter and/or find cheap treasures.